Papagayo is a free to download Lip Sync tool for animators. It's specifically designed for use with Smith Micro's Anime Studio but even on its own it makes for a useful planning tool for lip syncing your animations. At first glance the interface looks rather technical and complicated but a quick run through of the short tutorial reveals a very simple to use program. You'll be lip syncing easily within minutes. Unfortunately the current Windows version will only open .WAV files, which is a touch inconvenient for me as I usually record all my audio into MP3 files, but aside from that it works great. What the software allows you to do is audibly and visually lip sync your audio by matching typed words and phonetic sounds to the audio wave form, which in turn tells the animated mouth which image should display on what frame at any given time. words to the voice clip as you hear them. Once you have your audio synced, if you have Anime Studio you can simply import the resulting DAT file into your project and control any character's mouth with it (you're not limited to the mouth styles in Papagayo). If you don't have Anime Studio and your animation software doesn't support the DAT files produced, you can save your work as a Papagayo file. Then use it as a reference when animating your characters mouths in whatever software you are using. Papagayo gives you both the frame number and the mouth shape you'll need at any point within your audio file. 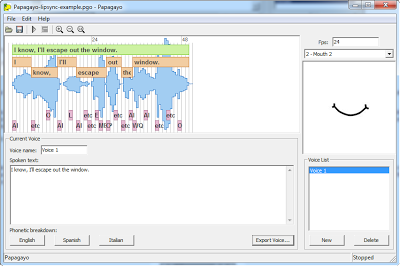 One thing Papagayo will let you do is lip sync multiple voices within the same sound file. For example if you want to lip sync a conversation between two of more actors all recorded in one audio file. Once you've lip synced each actor, each voice can be exported separately to its own DAT file. 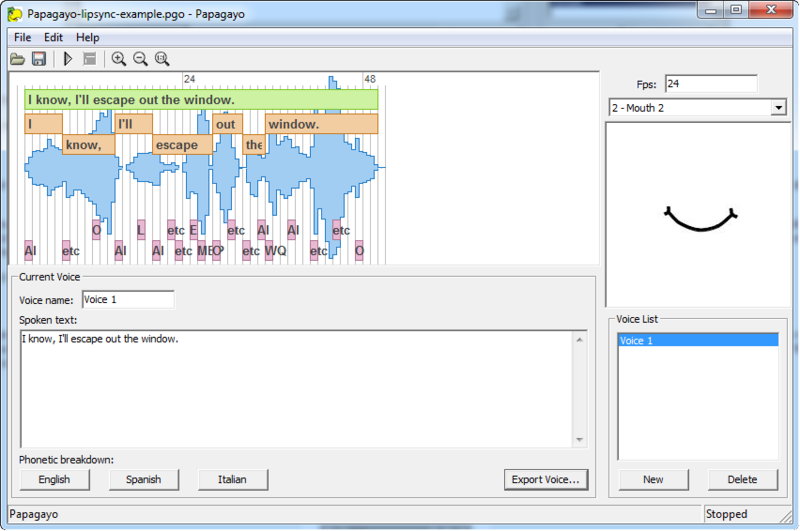 Papagayo is a neat little tool that takes out much of the thinking usually involved with lip syncing. Which is a good thing if the process of manual lip syncing baffles you or is something that you find is just plain tedious.